Clean faster and better without the use of harmful solvents! As this area's authorized dealer for CUDA Parts Washers, we distribute the finest parts washing cabinets available. CUDA automatic parts washers provide a safe and efficient solution to cleaning parts because they eliminate the need for harmful cleaning solvents. Plus, they provide businesses with a time-saving solution. Your staff can simultaneously clean parts while performing other tasks. 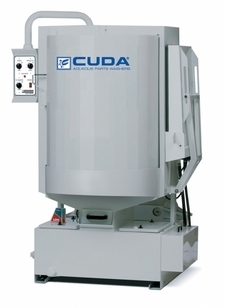 CUDA automatic parts washers are aqueous based, industrial size washers that use pressurized jets of hot water and specialized detergents to deliver cleaning power that is far more efficient than washing parts by hand. Simply load parts, turn on the washer and walk away for 15 to 20 minutes while parts are automatically cleaned thoroughly and efficiently. A parts washer will lower your monthly expenditures! 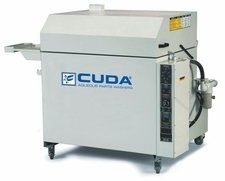 You can start saving today with a CUDA automatic parts washer. You will recoup your investment in no time, by increasing your billable hours. Compare what you’re spending today - calculate your savings now.